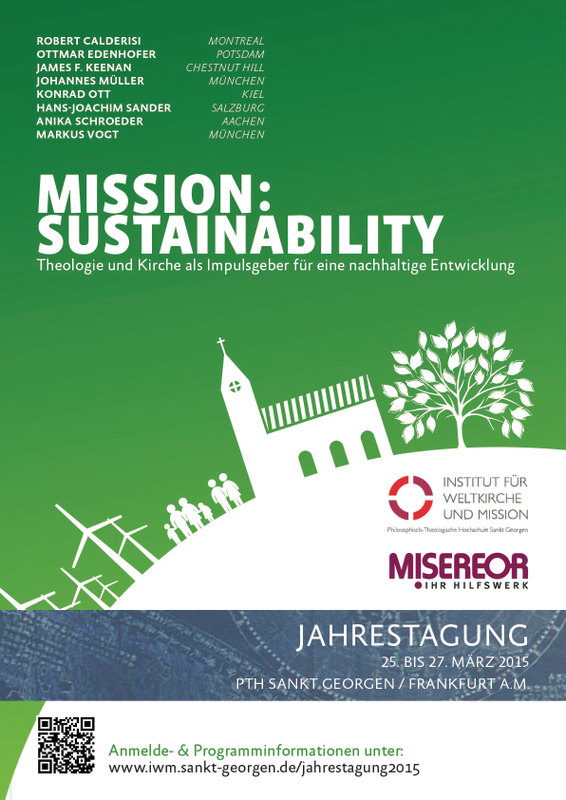 “Mission: Sustainability – Theology and the Catholic Church as stimuli for sustainable development”. 50 years ago, at Vatican II, the Catholic Church set the task of facing the “joys and the hopes, the griefs and the anxieties of the men of this age“. In this perspective, it is surprising that – until now – the church has been reserved in her responses to the current global challenges that can simply be summarised under the keyword “sustainability”. Regarding their characteristics, the church is capable of providing significant stimuli for a sustainable development, both on a global and local level. In this context we want to discuss the question what an explicit Christian input could look like and which steps are necessary. The International Symposium will be held from March 25th–27th 2015. For registration please use our online registration form (open until 6th March 2015). Registration fees are: Regular price 90,-€ / reduced price 50,-€. There are limited guest rooms available during the conference. These rooms are simple single rooms with wash basins. Shower and toilet are on the floor. If you want to stay overnight, please tick the box „Registration fee + Overnight stay“ in the online registration form to let us know. Prices for registration, accomodation and breakfast in our refectory: Regular price 150,-€ / reduced price 100,-€. The presentations will be held in english and german. Simultaneous translation is provided. 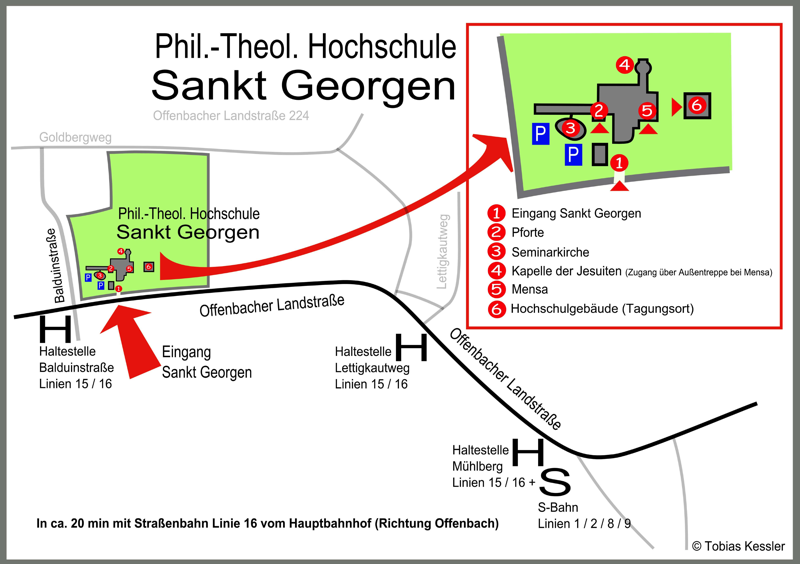 The conference will take place on the campus of Sankt Georgen Graduate School of Philosophy and Theology (Philosophisch-Theologische Hochschule Sankt Georgen) in Frankfurt am Main. To enlarge please click on the picture, to download the PDF please click here. With tramway 16 (towards “Offenbach/Stadtgrenze”) get off at “Balduinstraße”. To reach Sankt Georgen backtrack 100m. Possible transfer options from “S-Bahn” to tramway 16 are at the stations: Hauptbahnhof, Südbahnhof and Mühlberg. Using the A661, get of at Kaiserlei-Kreisel in Offenbach. Exit B 43/Strahlenbergerstraße in the direction of Sachsenhausen/Oberrad. Follow B 43 along the “Deutschherrnufer” for around 1,2 km. Turn left in the direction of Oberrad. At the next traffic lights turn right into the “Offenbacher Landstraße”. Around 700 m from here you will find Sankt Georgen on the left side. Using A3, Exit: Frankfurt-Süd. 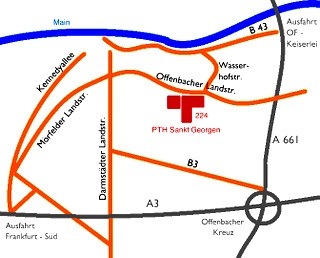 Following the “Mörfelder Landtstraße” it will transfer in to the “Offenbacher Landstraße”. Follow this road till you reach the Sankt Georgen on the right side. The registration for the upcoming international conference 2018 “Christianity and Mediation” is now open. 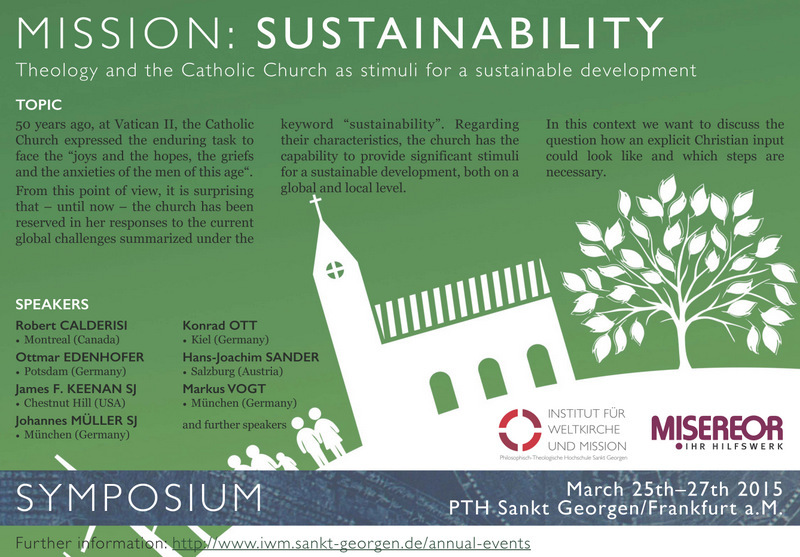 From March 25th–27th 2015 a three day conference has been hold about “Theology and the Catholic Church as stimuli for sustainable development“. On Nov 5th 2015 an IWM study day on the role of bishop’s conferences within the Church has taken place in Sankt Georgen College/Frankfurt. On April 8th 2014 a study day on “A poor Church for the poor” has been hold at Sankt Georgen College/Frankfurt. From September 24th-26th 2013 we organised an international symposium on Theology of Religion and its Missiological Consequences. From September 27th-29th 2011 we had organised an international symposium on “Contextuality and Universality of the Gospel”. From November 23th-25th 2010 we had organised an international symposium on Pentecostalism.